The performer displays a beautiful Rosewood box which contains six black dice. The dice are arranged in sequence from one to six. The lid is replaced and the spectator is given a die and a shot glass. He is to shake the die within the glass and then to toss the die onto the lid of the box. What ever number comes up with be the chosen number. 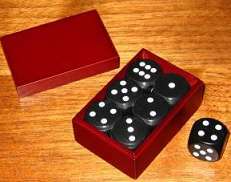 The die is dumped onto the lid of the box and a six is rolled. The lid of the box is removed and incredibly all the dice in the box have changed their values to match the rolled number...all the dice now show the six spot side face up! The dice can be removed from the box by the spectator and everything can be examined. Reset takes but 30 seconds and may be repeated and the results will be different! Comes complete with Rosewood stained box, dice, shot glass and that secret something plus great instructions. Highly recommended; top quality made by Collectors' Workshop.